If you look at the Twins and see their roster you probably think, "Well here goes another typical season of bad baseball by the Twins". Well that might be true, but there are some positives to look at. What a lot of people don't see is they are grooming this team to start competing within the next four years. Joe Mauer will officially move to first base full time, doing so the Twins hope to get more than 100 games out of him and lay off on the injury bug. 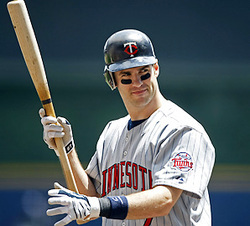 Josh Willingham returns this year and should slug his typical 30+ homeruns. The Twins also brought on catcher Kurt Suzuki to fill Mauer's everyday catching duties, but don't be surprised if young up comer Josmil Pinto takes over the every day catching duties by the years end. In pitching the Twins brought in Ricky Nolasco and Phil Hughes, both players should help solidify the Twins and help them get back to the top of the central in the next couple of years. Now although the Twins may struggle this year, with the acquisitions they made this year, and with the young talent such as Byron Buxton, Miguel Sano, Alex Myer and Kohl Stewart developing, the Twins should be a force to be reckoned with here very soon. The Royals are going to be one of the most exciting teams of this year. The Royals showed last year they are building to make a great team and they are almost there. They had a huge off season signing guys like pitcher Jason Vargas, utility Omar Infante, and OF Norichika Aoki. Those additions should solidify the Royals, and help put them in contention for the AL Central. The Royals also bring back Mike Moustakas, Bill Butler, Salvador Perez, Alex Gordon, and basically rest of the 2013 Royals team. One player that should make a huge impact this year is Justin Maxwell. Maxwell was acquired by the Royals from the Astros, and basically carried the Astros to what little wins they had so it will be interesting to see how he does on a pretty solid team like the Royals. Look for Maxwell to be a part of the Royals everyday lineup and help contribute to what should be a solid season for Kansas City. The Tigers are not the same team from the last couple of years separating with several of their regular cast members. Detroit did answer one of their weak spots in the lineup by getting Ian Kinsler from the Texas Rangers. If Kinsler plays like the Ian Kinsler of old, he could wind up being a be a 30/30 type of player. The unfortunate part of getting Kinsler was giving up Prince Fielder. Fielder has been the center point of this lineup and has protected Miguel Cabrera in his MVP seasons. It will be interesting to see how Cabrera does without Fielder to back him up. The Tigers also lost second baseman Omar Infante to free agency. Infante isn't a huge name and he probably never will be, but Infante is a great base on balls hitter and really solidifies any team's needs. The last subtraction/addition came from Doug Fister. The Tigers sent Fister to the Nationals in trade for Steve Lombardozzi, Ian Krol and a couple of minor league prospects. Lombarozzi will help fill the shoes of Omar Infante, being that Lombardozzi can play all infield positions. The Tigers will definitely have a new look this year, and first year manager Brad Ausmus will have his hands full without a doubt. The bright side is that with veterans like Justin Verlander, Matt Scherzer, Miguel Cabrera and Tori Hunter the Tigers will still be in the hunt for the AL Central crown. The Indians come into the 2014 season with not many changes, but they did lose starting pitcher Ubaldo Jimenez to free agency. The Indians main acquisitions are closer John Axford and right fielder David Murphy. Both players should fill several voids that the Indians had last year, and young pitcher Danny Salazar will help the Indians forget about Jimenez. With Francona returning to the helm the Indians should find their selves back atop the AL: Central. The White Sox have been one of the teams this off-season that has stayed pretty busy. They started their off-season by signing Cuban defector Juan Abreu. They then went on to trade for 2013 Futures Game MVP Matt Davidson and Adam Eaton. Davidson could start the season in AAA-Charlotte, but I expect him to take over the third base duties regularly by mid-season. Eaton will become an everyday starter in CF. With that being said, the White Sox still brought back bring back favorites Paul Konerko, Chris Sale, Adam Dunn, and Alexei Ramirez. Look for the White Sox make a complete 360 and get back to what they are used to.